Delîl Mîrsaz, is a Kurdish folk singer, and a well-known musician who has been producing traditional Kurdish music for many years. At the same time as producing traditional Kurdish music, Delîl was also carrying his weapon in the fight against ISIS terrorists in Rojava. Before the start of the Rojava revolution, Delîl Mîrsaz was a member of the musical group Koma Rojyar in the mountains of Rojhelat, and produced a number of remarkable records of traditional Kurdish Music. As a result of the Rojava revolution, Delîl Mîrsaz returned to his homeland ‘Rojava’, in order to continue his musical act as well as to defend Kurdistan with his comrades. In regards to the official policies of the regime towards Rojava, Mîrsaz stated that the Cezire Region had a strong Arabic culture imposed in an attempt to fade Kurdish traditions. In most cities and towns of Rojava, Arabs have been intentionally introduced and the traditional Kurdish dominated community structures deliberately destroyed. Further, the most fertile and traditional lands in the Kurdish areas had been confiscated by the regime and gifted to Arabs. This policy led to growing anger and hatred between Arab and Kurds. Due to these pro-Arab policies, Kurdish Artists were never allowed to perform their art freely; and if any Kurdish singers dared to sing nationalist or patriotic songs they were imprisoned or forced to flee the country. Despite all these obstacles, Kurdish singers such as Mihemed Teyyib Tahir, Seîd Yusif, Elî Şakîr, Mehmud Ezîz, Hoznî, Ebdulla Alanî, and Ebdulezîz Samî were still able to preserve Kurdish traditional arts and songs. In regards to the field of acting and theatre Mr. Mîrsaz highlighted that “the role of Kurds in theatre was likewise prohibited; therefore, acting and theatre in the Kurdish areas had not gained the opportunity to progress and develop. In the field of fine arts, the talented people in this field were often neglected or dismissed. Ehmed Dawud, for instance was a very talented person but was forced to leave the country into exile in order to escape persecution. Mîrsaz stated that despite the establishment of art and cultural centres in every city, the Kurds were not allowed to work and to be members in these centres during the Assad regime. 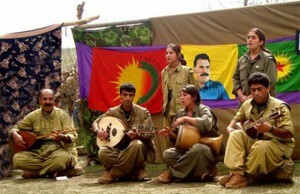 Even the Kurds who were members of the Syrian Ba’th party could not perform in Kurdish. The only celebration Kurds were allowed to have in Rojava was during Newroz. However organizing celebrations was very difficult due to government crackdown and it was only celebrated among small groups of neighbourhoods, as people were afraid to celebrate publically. Sometimes, singers and music group were kicked out from houses in fear of retaliation from the regime. Since the start of the Rojava Revolution, all Art services have been resotred and running in co-ordination. At the same time, each centre retains its own independence. On the other hand, in the past only a particular group, usually Arabs, could work in these centres. But now, as a result of the Kurdish revolution, the gates are open to any willing participant and they have all rights in these centre, irrespective of culture, race, religion or gender. Previously, these centres were only for the promotion and creation of a unified society; but now these centres are attempting to return the dignity of society, the music and the arts through giving all peoples an equal voice. Of course, this process is not easy and cannot be changed immediately. History was written by people who were part of the system and they disfigured all aspect of the history of other culture and that of minorities. In order to respect and provide a voice to these silenced cultures the Arts have to actively act ethically so that we can show the history of oppression and violence suffered by minorities and to rewrite a new history. Most remarkably, according to Mîrsaz, due to the oppression of the regime there were only a small handful of singers in Rojava. However, nowadays due to the increased freedom there are many different groups emerging and playing important roles in re-establishing the theatre, arts and cinema. This is a huge development and significant steps are being made by these artists in rehabilitating and advancing the arts. In fact, recently these artists produced a short movie and released it in local cinemas in Rojava.